Dual 120V/277V voltage. Charge rate/power “ON” LED indicator light and push-to-test switch for mandated code compliance testing. Long-life, maintenance-free, rechargeable NiCd battery. Internal solid-state transfer switch automatically connects the internal battery to LED lamp heads for minimum 90-minute emergency illumination. Fully automatic solid-state, two-rate charger initiates battery charging to recharge a discharged battery in 24 hours. Surface mount via quick-connect back plate; fits most standard size junction boxes and snaps into place to make internal electrical connections. Conduit mount knockout on top of housing. Suitable for wall or ceiling mount. Long lasting, efficient ultra-bright white LEDs. High-performance chrome-plated metalized reflector and polycarbonate lens for optimal light distribution. 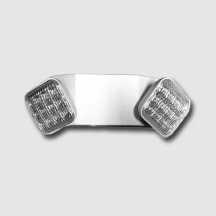 Adjustable LED lamp heads provides optimal center-to-center spacing. Optional high-lumen heads are available for increased center-to-center spacing.